a cumulatively large effect that a very small natural force may produce over a period of time. There are several kinds of effects. Ripple. Domino. Avalanche. Chain reaction. I chose Butterfly based from the definition above. I am this very small natural force adding to the influence, the purpose, to make lives, even when only one life is involved, a little bit more significant. 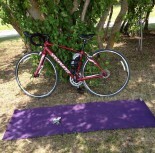 Yesterday was the onset of my Free Yoga @ the Park. I had jitters and hit the panic button quite often until it won’t make a sound anymore and died whining amidst the chaos I am creating within me. A simple flapping of the wings can dramatically turn into dread – frightful and alarming and you feel the wings begin shrinking. I took a walk on the very spot we had our class, two days prior. It wasn’t planned. As I was driving, it felt right to be there at that time. I began scaling the grass, walking in my bare feet, feeling the place. It was a serene, hot afternoon. Calming. And I heard my heart whisper, I heard myself say, “This is a the right path to do because it feels good to simply give”. Cultivate something and eventually share it. You can only freely give what you have in abundance. It has only been the first free class. There are three more for this month. This may or may not progress into something; but I can say I am at peace with whatever the effect would be. Simply surrender. Trust the process. Until then, I am going to keep flapping my yoga wings. The calm after flapping my storm. Thank you to Yoga with Brettan for giving an awesome tip, to AmritaSpeaks for her article on Fields of Yoga, Julie Campos Farmer, who gave me lots of insights, and to CultFit for giving some of the essence of his time. All of our small efforts prepare us for something bigger. Good luck on the classes!